Dr. Heidi Bassler is passionate about cats and dogs. She is devoted to their health, well-being, and comfort. Her special interests include dentistry, internal medicine, pain management, dermatology, and ear disease. As a primary care veterinarian, Dr. Bassler focuses on the lifetime well-being of your pet. Special attention is given to pediatric visits and senior care. Pain management is an important part of her practice, and includes preventive care, nutritional supplements, medications, and laser therapy. Dr. Bassler is committed to making her patients feel better. When illness arises, Dr. Bassler is knowledgeable and equipped to help diagnose and treat your pet. She is well-versed in internal medicine and is asked to consult on challenging second-opinion cases. 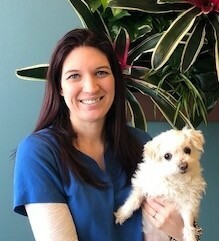 Dr. Bassler has extensive training in veterinary dentistry and focuses much of her practice on the oral health of pets, including oral exams and radiology, pediatric dentistry, periodontitis (gum disease), feline stomatitis, and surgical extractions. She published a case summary on the Foundation for Veterinary Dentistry's e-newsletter; click here and scroll down to read the summary. 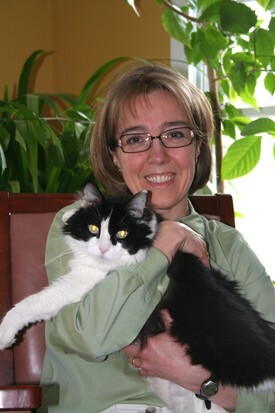 Dr. Bassler earned her Doctor of Veterinary Medicine degree from Atlantic Veterinary College in Canada with several awards. Earlier in her career, she performed post-doctoral research at Cornell University. She was a pioneer in developing the rapid polymerase chain reaction test, commonly referred to as Real-Time PCR. This test uses computer technology to detect DNA from disease-causing organisms, and is frequently used today in human and veterinary laboratories. Dr. Bassler published her ground-breaking research in Applied and Environmental Microbiology. Click here to read her article. Dr. Bassler is licensed to practice veterinary medicine in Massachusetts and New Hampshire. She is also involved in various local groups, and supports Anna Jaques Hospital, Jeanne Geiger Crisis Center, Firehouse Center for the Arts, and Newburyport's Chamber of Commerce. In addition to daily communications with pet owners, Dr. Bassler enjoys educating the public through various media outlets. Her newspaper column, Paw Prints, appears monthly in Newburyport's Daily News. Click here for the most recent article. For almost a decade, her radio show, Your Pet's Health, aired every Sunday morning from 8:30 am to 9:00 am on WNBP (106.1 FM). 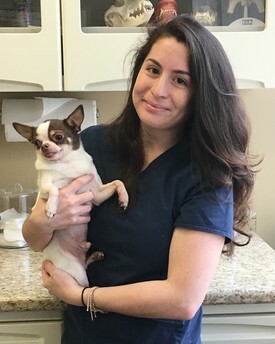 Most importantly, Dr. Bassler understands that good communication with pet owners is essential to helping her patients feel better and stay well. Her goal is to help your pet live a long and happy life with you. Dr. Jennifer McClellan is Board Certified in Veterinary Internal Medicine. After obtaining her Doctor of Veterinary Medicine degree from Cornell University, she completed a rigorous residency program in this field, and successfully passed the board examinations to become an internal medicine specialist, as a Diplomat of the American College of Veterinary Internal Medicine (DACVIM). Dr. McClellan performs abdominal ultrasound and echocardiograms (sonograms of the heart). 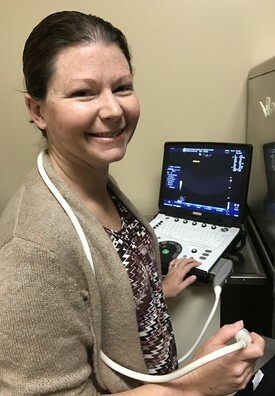 She combines her expertise as a skilled ultrasonographer and brilliant internist. Dr. McClellan consults on those cases that require her expertise in advanced imaging. Dr. McClellan is available at Bassler Veterinary Hospital by referral appointment. As a veterinary surgeon, Dr. Zuckerman limits her practice to complicated pet surgery cases. 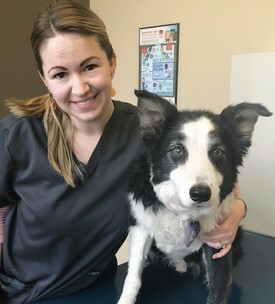 She received her Doctor of Veterinary Medicine degree from Tufts University, and completed her surgery internship at South Shore Veterinary Associates. Dr. Zuckerman has been instrumental in providing competent emergency and surgical care for cats and dogs in Massachusetts and New Hampshire. She was a founding member of the Emergency Veterinary Clinic in Portsmouth in 1991, and continues to practice in the seacoast area. Dr. Zuckerman joins the Bassler Veterinary team for complicated surgeries. With the addition of this skilled surgeon, we are able to offer even more advanced care for our patients. Dawn is our Hospital Administrator and senior Veterinary Technician. As Hospital Administrator, Dawn keeps behind-the-scenes at Bassler Veterinary Hospital humming smoothly. For example, she makes sure the medical equipment is maintained and in tip-top shape, so that there are no hiccups if your pet is in need. Inventory, pharmacy, and supplies are also her responsibility. When your pet's check-up and vaccines are due, Dawn sends your postcard reminders. You even have Dawn to thank when your pet's health insurance or coupon rebate checks arrive at your home. 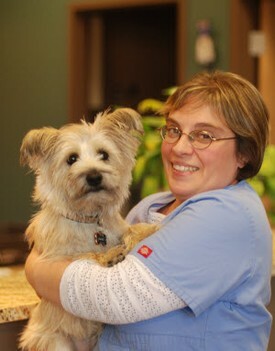 Dawn has been a Certified Veterinary Technician for almost 20 years. She graduated from Essex Agricultural and Technical Institute with an Associate's Degree in animal health science. She has been assisting veterinarians, caring for pets, and educating their owners ever since. Dawn is a member of the Massachusetts Veterinary Technician Association, as well as the National Association of Veterinary Technicians in America. She is also actively involved with the American Diabetes Association. In addition to all her other animal interests and veterinary experience, Dawn enjoys veterinary dental care. 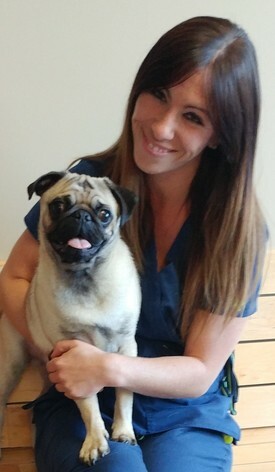 She is trained in veterinary dental hygiene and oversees oral hygiene and dental radiology at BVH. When your pet leaves our office with pearly whites, fresh breath, and a beautiful set of personal digital dental radiographs, Dawn is likely the one to thank! Dawn is also certified in Companion Animal Laser Therapy. This Class IV laser decreases pain and promotes healing after surgery or dental procedures; other applications are chronic painful conditions such as arthritis. 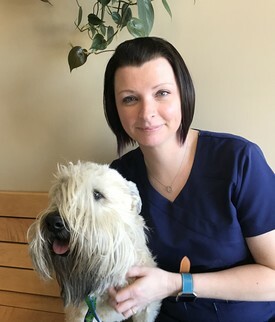 When not at Bassler Veterinary Hospital, Dawn enjoys spending time with her rambunctious Cairn Terrier, Sawyer, who is in the never-ending search for perfect obedience, and has obtained his Canine Good Citizenship certification. Kelly has devoted her life to animal care. She started as a veterinary assistant when she was a teenager, and later went on to become certified as a Veterinary Technician. She enjoys all aspects of feline and canine care. 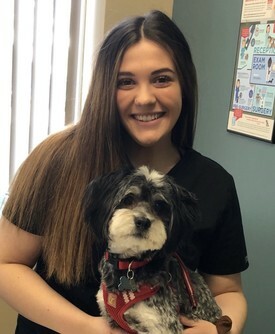 Kelly is particularly interested in primary care practice so that she can develop a bond with her patients and their owners. She lives in nearby New Hampshire, with her family and her silly Wheaton Terrier, Piper. Amber is a terrific veterinary technician, and we’re thrilled to have her at Bassler Veterinary Hospital. She is skilled in every area of the hospital. You may meet her during office visits, gently holding animals for their examinations. 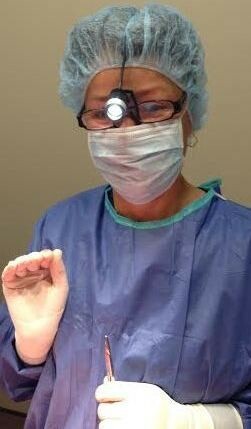 Behind the scenes, she is a competent anesthesia nurse and provides TLC to surgical patients. Amber is also a key technician with other tasks such as phlebotomy, IV catheter placement, laboratory procedures, and taking radiographs. Amber has a lot of experience providing healing and comfort to patients and is certified in Companion Animal Laser Therapy. Amber started her career in veterinary medicine in Florida, then took the brave trek north to Massachusetts. Her maltese, Khloe, likes to bring Amber for walks on the beach; sometimes they check out the beautiful hiking trails together, too. In her spare time, she adventures into Boston for sight-seeing. Heather is extremely passionate about her job! She has been rescuing animals her whole life and has no plans to stop. After going to college in Boston for Ballet she quickly decided to turn her passion for animals into a career. She started off by volunteering wherever she could and worked her way into a job in daycare where she honed her skills with animals for several years. Heather is now happily in her second year as a technician and her love for her job shows in everything she does. You can find her in exam rooms with Dr Bassler practicing gentle restraint on your pet, in the lab running tests, or in surgery assisting with the safest anesthesia monitoring. Her favorite part of the job is seeing patients come back happy and healed from treatments. She is originally from Massachusetts but now lives in New Hampshire with her boyfriend Matt and their spoiled cat, Wendy. Gabby was delighted to join our outstanding team in early 2017. She had recently moved to Massachusetts from Tennessee, where she lived for four years and worked as a veterinary technician. Gabby loves cats and dogs. At BVH, you’ll see her assisting the doctor in exam rooms. She also helps during surgery, and is diligent in providing behind-the-scenes compassionate nursing care to patients. In addition to being a full-time veterinary technician, Gabby is studying for her Bachelor’s Degree in Biology at UNH. Despite her busy school and work schedule, she still finds time to spend with her family. Gabby lives in Amesbury with her husband, two children, three crazy dogs and an equally crazy cat, and she loves every minute of it! Samantha loves animals and is delighted to contribute to their well-being. At Bassler Veterinary Hospital, you can find her monitoring, exercising and caring for the patients. When she isn’t assisting veterinary technicians or the doctor, she is responsible for keeping the hospital clean and sanitized. Samantha was born and raised in Salisbury, where she currently lives with her two grandparents and her spirited Havanese, Ziggy. As a young girl, Samantha was surrounded by animals and has been passionate about them ever since. She previously worked at a pet store for over two years. There, she groomed and cared for dogs and cats, and advised customers on their pets’ needs. Samantha graduated high school at The Governor’s Academy and continued her education at the University of New Hampshire for two years. Ultimately, she decided to take time off from school to reconsider her career. Samantha is anticipating a future in the veterinary field. If she isn’t at the hospital, you can find her out venturing local walking trails with her pup Ziggy. You can't miss Crystal's lovely smile when you visit our hospital. Crystal has had a passion for animals since she was a little girl. Her current role combining receptionist and assistant duties helps the hospital run smoothly. You may meet friendly Crystal at the front desk or find her helping the technicians and doctors with patient care. Crystal grew up with dogs, cats, and reptiles in her household. As she became an adult, she worked at a doggy daycare and enjoyed every minute of it. She then started her own dog-walking and pet-sitting business on the side and has continued this throughout the years. Eventually, Crystal decided to venture out into the medical side of animal care and joined the team at Bassler Vet. Crystal currently lives near Salisbury. When not at Bassler Veterinary Hospital, you are likely to find her at the gym, or hiking with her two dogs, Shyloh and Brody. 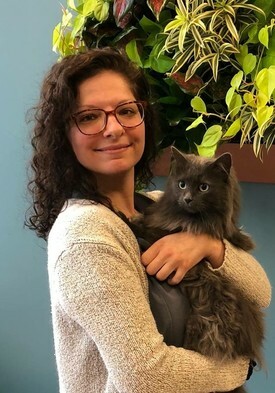 After graduating from Essex Agricultural and Technical High School, Jennie continued her education at North Shore Community College where she received her certificate in Animal Care. She spent many years working with animals in doggy daycare, as a pet sitter, and as a veterinary assistant. After her second child she ventured into the childcare field as a Preschool teacher and has recently returned to the veterinary field with us as receptionist. Jennie currently lives in Salisbury with her husband and two young children. Their home is ruled by three dogs: Kaden the Border Collie, Kyzer the German Shepherd, and Gunner the Golden Retriever; and two ferrets – Nibbles and Kia. Jennie is a busy lady but still finds time to enjoy camping and her family.